When it Comes to Bullies, Wishing them away doesn’t work. If you want a bully to stop and leave you alone, you have to change what you are doing. Stopping bullying can be done. What doesn’t work, is just hoping it will stop. Wishful thinking, is nice. But it doesn’t make bullying stop. What does? Ahh – that’s the million dollar question. Well – maybe not a million dollar question. I literally can answer it for you and you can access everything on this website – for free. So – no I am not a millionaire and am not getting rich by teaching people how to stop bullying. Regardless – the question at hand is – how to make it stop? The answer? Use compassionate non-compliance. 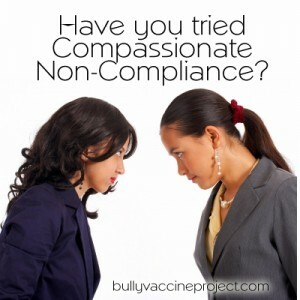 What is compassionate non-compliance? You respond compassionately – but you don’t give the bully what they want. You deny them their reward – with love and a smile on your face. And yes – this is scientifically validated. If you have an unwanted behavior – like bullying, you remove the reward. This causes the behavior to escalate for a little bit – perhaps a lot depending on the individual – but most people – stop pretty quickly. And then you keep not rewarding the bully and eventually – they stop. They key is how you stop rewarding the bully. This is where compassionate not compliance comes in. Respond compassionately – but don’t give the bully what they want. The normal advice is – ignore the bully and they will go away. It’s a round about way of trying to get to the compassionate non-compliance. The problem is – saying nothing – is often viewed as submission – and bullies like that. Getting angry – bullies also like because it means they unsettled you. They like that too. Give in and do what the bully wants? No. They really like that. What you want the bully to learn is that it doesn’t matter what they do – they will not get a reward from you. Does being compassionate with a bully mean you roll over for them? No – it means you respond compassionately while not giving in to their demands. Think of this like a game. They try to get a rise out of you. You respond compassionately and they get agitated and don’t know what to do. The tables are now turned. My book, and this website contains the information you need to better understand the behavioral dynamic playing out and how to better control it so you can be the nice loving compassionate person you want to be and still make bullies stop. Join this site, Get my Book and Learn how to stop bullies.